We are offering an exclusive online discount of £4.99 off class 4 MOT’s purchased and booked for Friday MOT appointments at ATS Euromaster. To take advantage of this promotion, you must purchase and book an MOT for a Friday appointment, online at www.atseuromaster.co.uk between the 3rd and 30th April 2019 (inclusive). All online Friday MOT purchases and bookings made bbetween the 3rd and 30th April 2019 (inclusive) will be eligible to claim this exclusive discount. To apply the discount, customers will have to apply discount code MOTFRIDAY into the Promotional Code field at the basket stage. 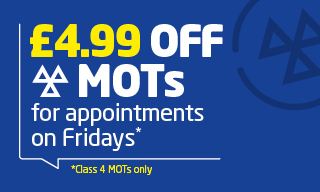 The discount will activate once a customer has selected an available Friday class 4 MOT appointment online (once you select your MOT Centre and appointment time). This offer is valid on class 4 MOT purchases made in a single transaction online or in conjunction with a Comprehensive or Standard service. Terms and Conditions for this offer can be found below. ATS Euromaster’s Retail Customers will be eligible to receive a £4.99 discount* when booking a class 4 MOT for Friday appointments online at www.atseuromaster.co.uk for a single vehicle in a single transaction. To access this discount please enter discount code MOTFRIDAY into the Promotional Code field at the checkout stage. £4.99 off your listed MOT purchase value (including VAT where applicable). This promotion is an online exclusive offer and is available to Retail customers purchasing a class 4 MOT alone or a class 4 MOT with a Standard or Comprehensive service only from the ATS Euromaster online shop only (www.atseuromaster.co.uk). This offer is not available to Customers purchasing in Centre, or Business or Account Customers. 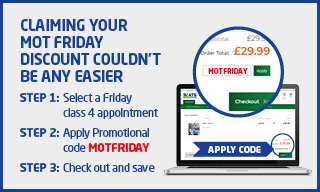 When purchasing this MOT offer online, apply the code MOTFRIDAY at the basket stage of the transaction. The £4.99 discount will be applied at the confirmation stage of the transaction. All MOT’s purchased under this offer must be completed by ATS Euromaster at an ATS Euromaster MOT Centre. The MOT appointment should be made at time of purchase and this discount is applicable only for appointments booked on a Friday. If you fail to turn up for your appointment, or need to rebook for any reason, the promotional discount difference of £4.99 will be recharged to you. The Friday time slots, and the discount associated are available on a first come first serve basis. Offers are subject to appointment availability. In some cases the Friday time slots may be fully booked and/or unavailable. In this instance ATS Euromaster does not have to honour this promotional discount. Available at selected class 4 MOT Centres only. ATS Euromaster reserves the right to amend or withdraw offers at any time without prior notification.